Wonderful textures: pillowy interior that isn’t mushy and a crispy exterior. I used my smallest scoop to portion out for frying. Couldn’t be easier and my house smells wonderful from the baking pitas. 2-7-2019 This isn't exactly a recipe, but more of a discussion about what goes into sabich. Recipes are given for some eggplant preparations, and for amba. I read this chapter about sabich, then put it together as I saw fit. Quite possibly the best sandwich I've ever eaten. Move over, falafel. 2-13-2019 This could be my favorite hummus topping. I make the harissa in the book, but include some preserved lemon and some urfa chile flakes. I do the peanuts in a skillet rather than the oven. This is really, really good. 2-12-2019 Delicious. For the 5-minute hummus, I make half a batch in the Vitamix, and add more garlic, just a whole clove for a half recipe, and more lemon juice. I include the liquid from the chickpeas and don't have to add water. The broccoli pesto is great. For the whole florets, I cooked in a skillet rather than the oven. Good but not great. For the 22 hours of marinading, the flavors of garlic, dill, and parsley were very mild. The best part was coming home at the end of the day and throwing the sirloin skewers and some vine ripe tomatoes on my stove top grill pan and having dinner ready in less than 25 minutes. Served with orzo and a green salad. 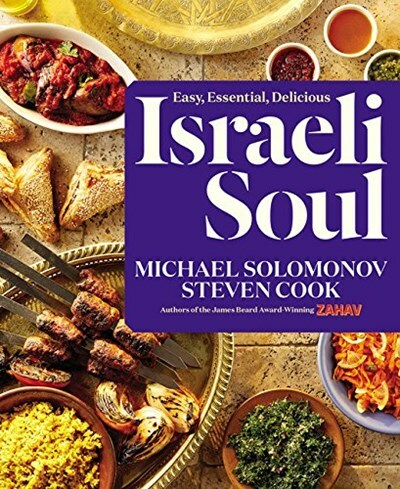 Israeli classics, fine-tuned for home cooking. The speedy hummus is excellent, as are the many chopped salads. Buy this book for the recipes, fall in love with it for the story. ...includes step-by-step how-to instructions and detailed close-ups of finished dishes so you can be sure that you're on the right track. Their finds include meals in the hand like falafel and pita; juicy, grilled and roasted spice-rubbed meats; stuffed vegetables; a wealth of chopped vegetable salads; a three-minute fluffy hummus with more than two dozen toppings; pastries, ice creams, and shakes. Solomonov has perfected and adapted every recipe for the home kitchen.